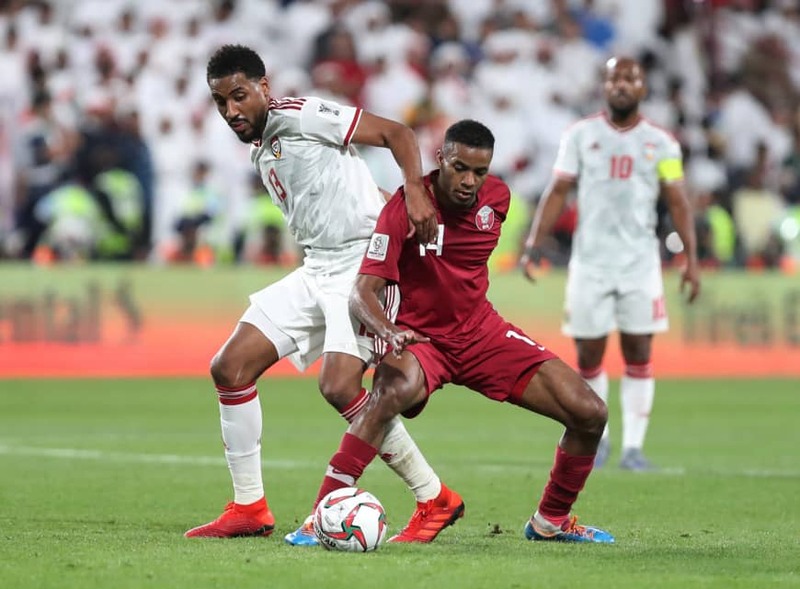 ABU DHABI - Surprise semifinalist Qatar thrashed the United Arab Emirates 4-0 on Tuesday to set up a meeting against Japan in the Asian Cup final later this week. Japan will be aiming for a record-extending fifth continental title in Friday’s final at Zayed Sports City in Abu Dhabi after beating fellow favorite Iran 3-0 in the other semifinal on Monday. Samurai Blue boss Hajime Moriyasu is poised to enter the record books as the first man to win the tournament as both head coach and player, having been a member of Japan’s victorious 1992 squad. With holding midfielder Wataru Endo injured, Al Ain defender Tsukasa Shiotani could be set for a return to the lineup following his sole start against Uzbekistan in the group stage. The 30-year-old Shiotani, who was drafted into the squad as a late injury replacement for Kawasaki Frontale midfielder Hidemasa Morita, scored the winner in the 2-1 victory over Uzbekistan. Qatar, coached by Spaniard Felix Sanchez, will be playing in the final of the quadrennial tournament for the first time. The Qataris’ victory over the UAE, led by former Japan coach Alberto Zaccheroni, followed a stunning 1-0 quarterfinal win over heavily favored South Korea. In a charged semifinal between politically feuding neighbors, defender Boualem Khoukhi gave Qatar the lead in the first half. Almoez Ali added a second before the break, while Hasan Al Haydos and Hamid Ismaeil scored late in the match. Qatar and Japan were both invited last year to play at the Copa America in 2019, giving the winner of this week’s match a chance to win a second continental title in July. Japan booked its spot in the final by prevailing against Iran in a battle of heavyweights on Monday at Hazza Bin Zayed Stadium in Al Ain. Injury-hampered striker Yuya Osako returned to the starting lineup to score twice, while Genki Haraguchi scored the third in extra time. 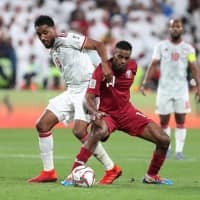 A regional boycott of Qatar, led by Saudi Arabia, has impacted the team’s logistics at the Asian Cup and made it difficult for the country’s fans to attend games. The United Arab Emirates, Bahrain and Egypt are also part of the boycott. Immediately after the victory, Qatar’s prime minister and foreign minister took to Twitter to celebrate. On the field, Qatar beat Saudi Arabia 2-0 in the group stage before the 4-0 rout of UAE on Tuesday. Khoukhi gave Qatar the lead in the 22nd minute, and Ali doubled the advantage 15 minutes later. Ali’s goal was his eighth of the tournament, equaling the record set by Iran forward Ali Daei in 1996, when the Asian Cup was also hosted by the UAE. The 22-year-old Ali will have a chance to break the record against Japan on Friday. In Doha, the capital exploded in noisy celebration as jubilant Qataris flooded the streets and roads after the team’s victory. Traffic along one of the city’s main highways, the Corniche, was jammed bumper-to-bumper with exultant fans, many honking horns or waving Qatari flags from car roofs, and others showing four fingers to emphasise the emphatic victory.